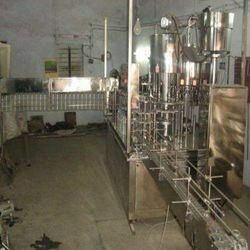 We are a leading Manufacturer of fully automatic rinsing filling capping machine, linear capping machines, automatic screw capping machine and automatic capping machine from Mumbai, India. With our spacious experience and knowledge, we are engaged in offering a wide range of Fully Automatic Rinsing Filling Capping Machine. Our entire product range is manufactured using quality assured raw components and advanced technologies. These have high tensile strength and are widely used for rinsing and capping of bottles. It is easily available at very affordable and reasonably economic market selling price. 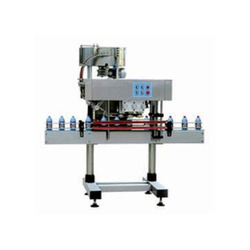 We are a prominent manufacturer and supplier of Linear Capping Machines, which is in hugely demand among the clients across the globe due to its longer working life and high performance. 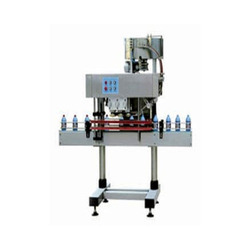 Linear Capping Machine is manufactured using advanced technology and used for capping different kinds of bottles. Salient features: Linear chuck caper and Side roller caper system Sturdy construction Longer working life High performance Corrosion resistant Specifications: Mitsubishi make plc system with 4" Touch Screen and VFD control for conveyor speed control Contact parts in Stainless steel 304 quality Body frame made up of Stainless steel or M.S powder coated No change parts required for different bottle size Motorized Bowl or Cap elevator for orientation of caps 8 feet conveyor with 6 Inches stainless steel slats Pneumatically operated head diving system In built memory to store 25 setting data Power 415 Volts 3 Phase 5D Hz. Available from 1 to 4 head. Applications: Chemicals Food Products Edible Oil Paints Lubricants Pharmaceuticals Kindly download attached pdf for more info. We are the leading manufacturer and supplier of the Automatic Screw Capping Machine. Manufactured using high grade raw materials and utilizing innovative production techniques. It finds extensive applications in packaging as well as domestic sector for its impeccable quality and precise dimensions. Customers can be easily purchase from us at industry leading rates. Cap Unscrambler : Vibratory type or Universal hopper depending on the type of cap. 'No bottle no cap'as a standard feature. 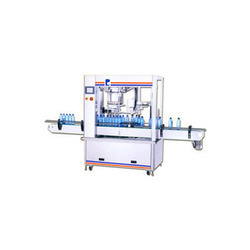 Supplying an extensive range of Automatic Capping Machine. These machines are appreciated for their excellent caps arrangement, easy operation and automatic drop procedure. Our range is capable of capping the bottles with high efficiency and quickly. These machines have the capability to automatically seal various size of cylinder-type bottle that matches aluminum theft-proof capsule. The offered machines are widely used in automatic packing lines for various kinds of wine and drink. Furthermore, sourced from trusted manufacturers, these machines are suitable to be used for capping bottles of different specifications. Looking for Capping Machines ?